M Financial believes that performance and cost should be measure over the life of an insurance product, not with an initial illustration or the first year premium. 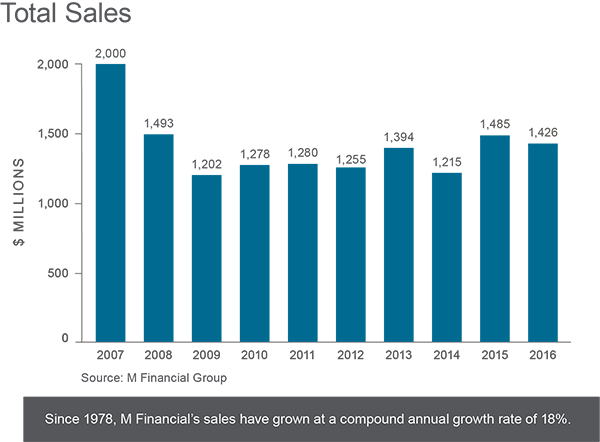 Since M Financial was started in 1978, M has continuously monitored the service, experience & performance of inforce business to ensure that proprietary products continue to be effective, from both a performance and a cost perspective. M Financial reinsures proprietary products through M Financial Re, M’s wholly-owned reinsurance operation. By investing upwards of $50 million per year in the high quality business place by M member firms, M Financial has access to partner-carrier pricing assumptions and can effectively track experience, while monitoring changes in policyholder interests. Sharing risk also aligns the interest of M Financial and its partner-carriers, which facilitates the development and ongoing management of superior-performing products. M Financial works with a variety of partner carriers to develop and manage differentiated proprietary products. The initial design of the product is important, but the sustainability of the product’s performance and effectiveness over time is critical to the long term success of the client’s plan. When better than expected experience emerges, M Financial works with its partner carriers to reprice the products – for both new sales and inforce business. This approach ensures that existing policyholders receive the value of the repricings, which are created by their superior mortality, persistency, premium volume, and expense experience, while creating an opportunity for new buyers to participate in the enhanced price of the product going forward. A 15-20% reduction in annual premium while still achieving a specified cash value target. A 45-150 basis point increase in cash value internal rates of return (IRRs) at life expectancy (age 85). In addition, given market volatility, performance enhancements on M proprietary products have worked to partially offset the impact of market declines, helping policies to remain on track. While these examples do not apply to all policies and these results may not be typical, M Financial continues to be diligent in its inforce management activity. M Financial has the experience, access, personnel, and relationships to constantly monitor experience and policy performance to maximize value for member firm clients.